Beautiful rug and just what I wanted. It was for my guest room which my 17 year old grandson uses and it's very masculine yet beautiful. It does need a mat or it will slip and slide even with furniture on it. Kaveh Handmade Geometric Red/ Blue Area Rug (8' X 10') - 7'10"x9'10"
Bring a little whimsy to your den with this flat-weave wool kilim area rug. 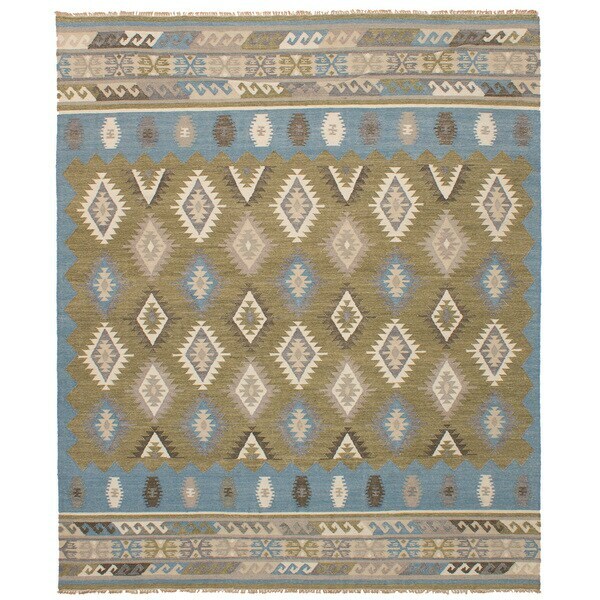 This reversible rug features an Anatolian tribal-style pattern in earthy blues and greens, and the durable wool on cotton construction is easy on wood floors and bare feet. Hala Handmade Geometric Multicolor Area Rug (8' X 10') - 7'10"x9'10"